Oceana Hamilton looks to make a pass. The senior center is looking to be among several Wildcats playing more prominent roles this season. Recently, Joe McKeown said he was rewatching Northwestern’s game against Iowa in the Big Ten Tournament last year. 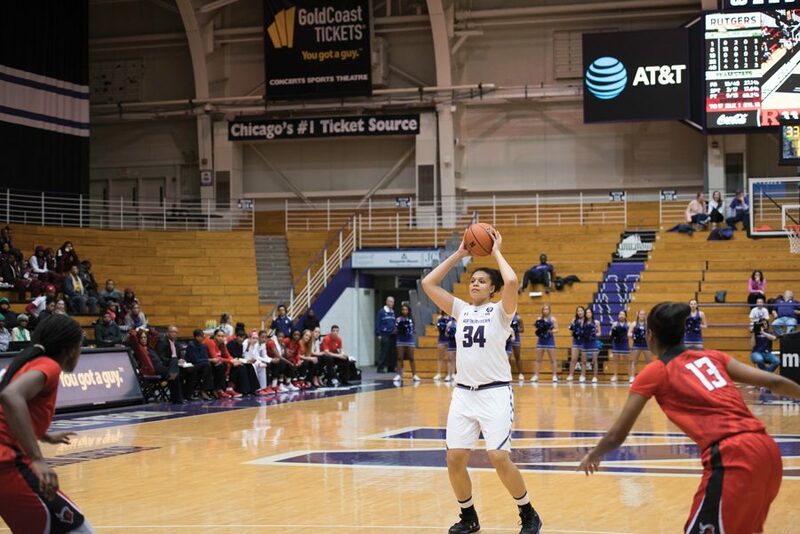 As he got deeper into the game, he remembered something: Nia Coffey scored 34 points, almost singlehandedly powering the Wildcats to an upset win in the penultimate college game for her and a handful of other decorated seniors. “I’ll miss that,” McKeown, now in his 10th season in Evanston, said with a laugh. Now, as NU prepares to open its season Friday at Chicago State, it must contend with the loss of nearly its entire starting lineup and the large majority of its scoring from a year ago, leading the program into an era of uncertainty without bona fide stars. With the high turnover, there are few returning contributors. Sophomore forward Abi Scheid is the Cats’ leading scorer from last year at 5.0 points per game, but she has zero career starts. Junior guard Amber Jamison follows close behind and had a strong stretch of Big Ten games midway through last season, but is not an experienced front line scorer. Junior forward Pallas Kunaiyi-Akpanah, an established rebounding menace, will likely be counted on to score as well, McKeown said, and senior guard Lydia Rohde, a starter at the beginning of last season, is an effective 3-point shooter but has struggled with injuries. Still, the amount of returning talent has left several players optimistic. Considering that versatility and having just five healthy scholarship guards, McKeown mused that he could play as many as three bigs at one time. Beyond Xs-and-Os, the Cats also have opportunities to fill leadership roles. Coffey and guards Ashley Deary and Christen Inman were longtime leaders and Coffey was a two-year captain, leaving a gaping void in mentorship for a team that has just two seniors. The graduated class was so valuable and durable that the Cats started only one Big Ten game with two players who remain on the roster. McKeown pointed to Rohde, a former walk-on who quickly worked her way onto scholarship, as NU’s new primary leader, lauding her work ethic as “the best … in our program in years.” In a nod to the Cats’ youth and inexperience, however, he also noted Scheid, who has played in just 31 college games, and freshman point guard Jordan Hamilton, seemingly the front-runner to take over that role, as additional leaders. Rohde said she is comfortable taking on leadership duties. Whether players like Rohde and Scheid can replicate the immense individual performances of their predecessors, however, remains to be seen. Scheid had a perfect shooting day en route to a 20-point effort in a near-upset of Ohio State in January, Rohde had three double-digit scoring games to begin last season and Jamison averaged 14.4 points per game over a five-game stretch of Big Ten play. But there were no 34-point performances like Coffey’s in the Big Ten Tournament. No player on the roster has earned postseason conference recognition, and not one has ever played in the NCAA Tournament. NU’s schedule is favorable, with few nonconference games against major conference opponents, and several Big Ten games against teams likely to sit near the bottom of the standings. And expectations, Rohde said, are high. Those are tall orders, given the top tier of the conference and the Cats’ recent track record. Programs like Ohio State, which features wunderkind scorer Kelsey Mitchell and was picked to win the conference by both coaches and the media, and Maryland, which has made two Final Fours in the last four years, seem the class of the Big Ten. NU, meanwhile, failed to make the NCAA Tournament each of the last two seasons despite high expectations and a top-15 ranking in December 2015. It would be a considerable surprise for a program that made only one tournament with Coffey, the No. 5 pick in this year’s WNBA Draft, to return the season after she departed. Despite that, McKeown, ever the optimist, is in trademark form.